Join Tokyo's first ever Ramen Tasting Tour! 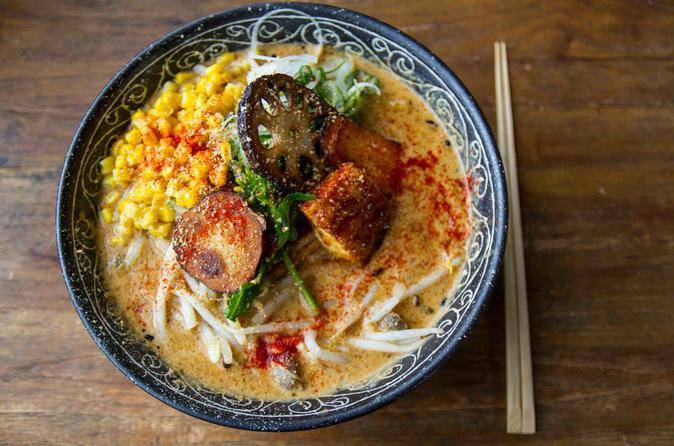 You'll taste wildly different types of delicious ramen at 3 distinct, award-winning ramen shops. During the 3 hours you'll sample 5-6, each bursting with unique flavors - whether a salty and spicy fish ramen, or a creamy and savory pork bone ramen. This variety is only possible because all ramen is served in mini bowls. These mini bowls are tour-exclusive (ramen shops only serve large bowls). You'll also get to customize your ramen, via fun menus created for the tour. Furthermore, you'll learn all about ramen - its history and future, how it's prepared, and how to eat it like a true local. Experience ramen like you've never before! From Naka-Meguro station you'll head to our first stop, Ramen Emoto - a cozy ramen shop tucked away in a small alleyway. They specialize in a light and carefully crafted fish (niboshi) ramen. Here you'll choose 2 ramen bowls from 4 of their their specialities. While we're waiting, you'll get to learn about ramen's history and how ramen is prepared. From Naka-Meguro, you'll head to the bustling area of Shibuya for our second stop, Ramen Nagi Butao. Here you'll get to enjoy a heavier and meatier pork bone (tonkotsu) ramen. You'll also get to choose 2 bowls from 4 options (Classic, Red, Black or Green themed pork bone ramen). The group will discuss the many different types of ramen there are. The last stop is Ebisu, arguably one of Tokyo's best ramen neighborhoods. At Shuichi Ramen, you'll sample fusion ramen at its best. Shuichi has mastered a savory and complex curry ramen. You'll choose 1-2 bowls from 3 options. As the last discussion point, we'll talk about ramen trends and the future of ramen!